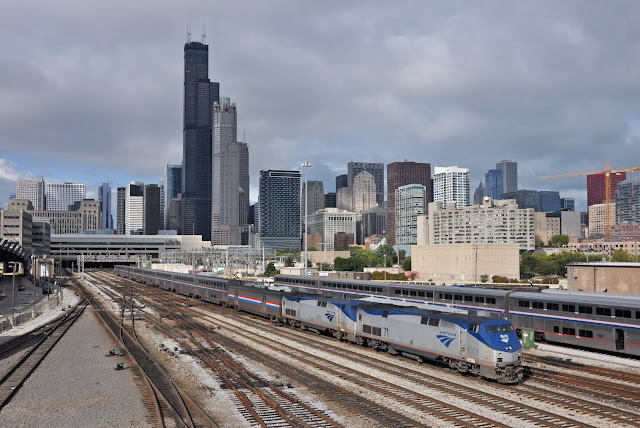 Not our train, but a similar long distance Amtrak Superliner service departs from Union Station beneath the Chicago skyline. James had made a rookie error at the hostel breakfast in choosing a table which was far bigger than the two of us needed. I returned from collecting my second croissant to find him sitting bolt upright surrounded by no fewer than five teenage German girls who had taken up residence at our table. We had until 3pm to board the Southwest Chief for the next leg of our journey to Williams (for the Grand Canyon) so headed out in to the gloomy day to get a better feeling for Chicago. A racing walk along the shore of lake Michigan followed by a cruise of the cities rivers filled the time nicely, and following a final walk through the city via a bit of clothes shopping and a Seven Eleven hot dog it was time to pick up our bags and head for the station. The Southwest Chief is on the boards. No taxi ride this time but somehow events still construed to make time very tight whenever I have a long distance connection. This time it was a long queue at the hostel reception to pick up our bags followed by a slight worry at the 'L' station- a train in the platform with its door shut, a green signal, but going nowhere. People on the platform looked confused and while we were only going 3 stops we did not need this delay now! The train did get moving quite quickly and we arrived at Chicago Union in time for our train. We had almost 15 minutes in fact before departure (you are supposed to leave 30) and having found Amtrak staff at our platform announced that we were intending to pop upstairs to grab some food. 'The door will shut at 14:55 Sir!' the steward said somewhat taken aback by our proposition. We knew we could visit 'Dunkin Dognuts' in less than the 11 minutes we had and fortunately we were right. 'That was quick' the steward responded as we joined the other passengers making their way onto the train from the Amtrak lounge. As the train begins its journey west there is one final view of the Chicago skyline from the right hand side of the train before we brace our selves for 'Prairie Day'. Before entering the prairies there is time for our first delay of the trip- only 13 minutes, caused by a Metra commuter train performing 'station work' in our path. We are settled into our Superliner Roomette by our attendant Phillip, when he can get a word in between Jean in the cafe car who is making a loud and seemingly endless announcement about how she will be running the cafe and train policies. Philip shows us the features of the room- light switches, power points, AC and the PA volume switch to 'shut her up'. We meet our nearest roomette neighbour, a well dressed lady who is approaching elderly but is clearly still very active. She has the look of a lady who was clearly very glamorous in her day but whom age appears to have fixed a permanent frown upon her face. She informs us that she is LA bound and after welcoming us aboard the 'slow train' reminds us that the best feature of the train is that you can shut the door- and she promptly does 'Goodbye'. Was it something we said or were we simply being too noisy? After booking our slot in the dining car for dinner it is time to explore my favourite part of the train, the lounge car. The coach features comfortable seats around tables at one end with the remainder of the car formed of seating in on es and twos which face out of large floor to ceiling windows. Freight trains and ranches pass by as we continue our journey at a good speed across the prairies of Illinois. Why fly when you can enjoy a comfortable seat and amazing views from the Superliner Sightseeing Lounge? Dinner in the diner- one of the pleasures of an Amtrak trip. Shortly after we are called to the diner by our host Kimberley we cross the mighty Mississippi River into Missouri. We meet our dinner companions for the night (Smaller groups will be put together around tables of 4). This couple are travelling through to Albuquerque as the husband won't fly- the trip is to see a relative and they make it several times a year on Amtrak rather than spending close to two days on the road. I order the seafood special- crab fishcakes as I've yet to have anything fishy since landing in the US. The fishcakes are very tasty and are washed down nicely with an exuberant glass of wine (non-alcoholic drinks and meals are included in the fare for sleeper passengers). My only criticism of the Amtrak diner is the insistence on using plastic tableware- much of it is clearly re-used, so, Amtrak, could we please have some china? A glass glass would be nice also as there is always a dissatisfied feeling at being served a 1/2 bottle of wine in a plastic cup- particularly when you are paying $16 for it! Having studied the schedule for the train we decided that the long layover in an hour of two at Kansas City is worth staying up for. The train is on time when we arrive here and there is amble time to walk to the front of the train for a look at the engines. Quite a lot of passengers change here and once we depart after 22:00 it is time to ask Philip to lower the bunks to convert our seats into beds. This time I have drawn the short straw and have the far less comfortable upper bunk- my sleep will suffer as a result. A pause in Kansas City- 120 and 837 prepare to head train #3 through the night. It is an earlier wake up call than I would like from Kimberley in the diner who informs passengers that the breakfast service (open from 05:30) is now full and anyone else wanting breakfast should give their names to be called when space is available. Kimberley couldn't advise how long the wait would be but did agree that getting up properly would be a good plan. It isn't long before 'James, party of two' is broadcast by Kimberly across the train. Our breakfast companions are Stephen and Rebecca- who has just returned to the US from a vacation to London to see her son in Islington (small world). Stephen comments on how they had picked up our English accents passing through the train and had hoped to be paired with us for a meal, and 'here we are'. I am again thwarted in my efforts to order French Toast for breakfast as it appears the train is part way through a menu change and it has been replaced by pancakes. 'French Toast that is really Pancakes' however is very good, as is the breakfast conversation. Stephen and Rebecca are well travelled themselves and as it happens met in London as students. Like us they see the train as part of their holiday and like to take a long Amtrak trip once a year. We discuss journeys we would like to make when Kimberley kindly reminds us that the table is required by more guests waiting for their breakfast. We retire to the lounge car to continue the conversation. Our first opportunity to step off the train since Kansas City last night is a brief smoking/leg stretching stop at La Junta, Colorado. The brief relief from the train is welcome though there isn't time to stray from the platform. Back on board the scenery becomes more varied and interesting and there is precious little time to be bored as we cross the Santa Fe Railroad's Raton Pass, including the only tunnel on the route and the highest elevation of our journey as we cross into New Mexico. The sightseeing lounge has now become busier and although seats are now at a premium there is room for everyone who wants one. Passengers from all classes and parts of the train are welcome here and this morning we have gained an interesting character- a tall black Afro-American man who must be in at least his 60's. He wears a cap, carries a stick and despite his mouth full of gold fillings is clearly high on life, singing to the coach 'You know 'ts going to be, a lovely day!' He seems blissfully unaware, or blind, to the fact that the seats near to him quickly vacate. He claims to be a comedian heading to LA, but I and others seem unconvinced. More likely from his loud and unprovoked proclamations 'I've had my Snap , Crackle & Pop', and 'Tony the Tiger ain't got nothing on me!' is that he is perhaps some sort of ambassador for Kellogs? Watching the Colorado scenery from the lounge car. The Santa Fe Raton Pass provides stunning morning scenery. Still full from breakfast (you are kept well fed on Amtrak) we opt for one of the later lunch sittings at 1:30pm. One of our companions is the lady from across the corridor who had initially seemed somewhat cold to us. She sees pleased to be sharing a table with her neighbours so perhaps we hadn't made such a bad first impression after all? While the lunch options are slightly limited (my first choice of both main and desert has run out) the conversation is flowing well. The usual topics are discussed; 'Why are you taking the train? ', 'Why wouldn't I want to see this view' is the response. The UK's Brexit and the currently looming US Presidential election are also discussed. Everyone we have so far spoken to has been open minded and fearful of what a Trump vote could mean- even Kimberley in the diner hints that she feels problems could be around the corner if a certain candidate gets the vote- she can't say it loudly thought as the group on the table behind us have been proudly wearing their 'Pumped for Trump' badges for the whole trip. Just an observation, but they didn't seem to be making as many friends on the train as some of the other groups. Frances, as she has now introduced herself bids us farewell and thanks us for the great company- I think we have established ourselves as friends now. Albuquerque is our major stop for the afternoon and although the train is running some 40 minutes behind schedule due to 'Signalling Problems', how familiar that sounds, we still need a good 35 minutes here for a crew stop and for the train to be serviced - This includes a fuel top up for the locomotives from a road tanker as well as trash collection and a chance to clean the windows. For the passengers it is also a chance to re-fuel from the somewhat underwhelming station cafe, or to peruse through the offerings of several stalls on the platforms which are selling local crafts. Of course I don't need any of this tat and a Mexican hat is unlikely to travel well in my bursting suitcase anyway. Despite this I am relieved of $27 which I have spent on soap. I seem to have a weakness for buying soap as this isn't the first time this has happened. Maybe I should get a t-shirt; 'If you're selling soap, I'm your man.' I chat to Frances on the platform who is thriving among the craft stalls, though I see she hasn't brought soap- or anything else for that matter. I also manage to pick up a postcard for home at the station and just before re-boarding I am cornered by the 'Pumped for Trump' ladies who have thus far forgotten to have their picture taken with the train. New Mexico scenery from the sightseeing lounge. Back on board the Southwest Chief it is a simple case of whiling away what remains of the afternoon in the sightseeing lounge until we are called by Kimberley into the diner for our final meal sometime after sunset. We arrive to see a somewhat disgruntled student at the far table who seems less than satisfied that this 7:45pm sitting has been delayed- we are left feeling slightly uneasy as we are sat across from him, making no attempt at conversation. Luckily we are soon joined by Bill to make up the full compliment of the table. Bill is chatty and inquisitive and after a while we do get Joshua to relax and join in the conversation. he is studying education at university in New Mexico and doesn't appear to be enjoying this- or the train ride. 'I'm not travelling with Amtrak again- this is terrible customer service.' I feel that possibly he has missed how hard the dining cars staff of two have been working all day to get everyone who wants a meal in up to five sittings per meal. As we order my mind is set more at ease as the beef steak I had been looking forward to is not sold out unlike some other options. I order it medium-rare and must say that it is delicious. Consider that a recommendation if you are on Amtrak any time soon. Joshua even enjoys his steak and concedes that he is glad to have ordered it 'medium-well' rather than 'well done', or 'burnt' as Kimberley described it. Conversation moves on to the state of rail travel in America and in particular the current plans for high speed trains in California. It isn't going to come cheap but all agree it would be a great step forward for the state which is one of the top 5 most populated areas of the world, yet has gridlocked roads and precious little public transport infrastructure. landscape is littered with lengthy freight trains of the BNSF. Our final destination on this leg of the train is Williams Junction, a short throughway bus connection from Williams and the Grand Canyon Railway. We should be approaching by now but with our delay there is a good hour and a half to spend in our room after dinner. It is a good opportunity for me to catch up on my notes as it is now dark outside. The train continues to loose yet more time at Flagstaff for no more apparent reason than people taking their time and checked luggage being removed from the train. Eventually the train slows for Williams Junction from where we will be getting off for our pre-booked bus to Williams itself. I seek reassurance from Philip our car steward that the bus will wait for the delayed train - I already know it will be but it I still feel reassured to know for certain. Frances bids us farewell and best wishes for our trip ahead as we pass in the corridor to collect our bags. Williams Junction turns out to be somewhat of a 'nothing' location from what I can see in the darkness. I'm not even sure if it is a junction- I must check that on Google maps sometime. [edit: I did, and it is.] Indeed the halt here is so diminutive that the train must follow a rather arduous procedure to set down and pick up its passengers; the platform (if you can call the piece of concrete and solitary lamp such a thing) is only long enough for one coach of our train, so each car with passengers for the stop must pull up individually, causing some initial confusion as to why we are not let off when the train first stops. On the second stop Philip opens the door, we bid our farewells and disembark. What awaits is not an air conditioned coach with Amtrak branding as I suspected, but a minibus pulling a luggage trailer. It is actually getting a bit cold so we give our luggage to the driver and take a seat in the somewhat dilapidated bus from which the paper is peeling from the walls. Some passengers are already on board and enquire whether we forgot to get off when the train had first stopped. As we explain, the train draws forward one final time to allow seated passengers off from the rear. With that the Southwest Chief is gone, the station light goes out and our bus is left alone in the darkness of the woodland. The driver, Clay, does a headcount and although we are one short there is no prospect of them arriving now the train has gone so the engine is started. The passenger light is flicked off and we start on the gravel road for Williams. The 10 minute journey is a rather un-glamorous end to our 30 plus hours of travel from Chicago.